What can you do in five minutes and 43 seconds? Plenty of things, from clipping your nails to heating and eating a Hot Pocket, but if you were Oregon’s men’s basketball team on Thursday, the one you could not do was score a field goal. That’s because the vaunted Virginia defense finally demonstrated, simultaneously, what makes the Cavaliers so tedious to watch and so devastating to play against. Over an almost-six minute period to end their round-of-16 game, Virginia shut down Oregon so thoroughly that an 11-3 Oregon run that put the Ducks up three with 5:43 left will be relegated into the annals of “we almost had them” lore. Between Louis King’s three to give Oregon that lead and the final buzzer, the only points scored by the Pac-12's 12-seed were four futile free throws. Virginia caused four Oregon turnovers in five minutes, two in the two possessions immediately after that King three-pointer: first, Ty Jerome stole the ball from King, before Mamadi Diakite pilfered Will Richardson for a steal of his own. But it was straight-up man-to-man defense that carried the day, as the Ducks failed to get any good shots near the rim, settling for jumpers on a night when they shot 37.8 percent from the floor (not that Virginia was any better, shooting 35.7 percent). Oregon missed five straight jump shots between 3:10 remaining and the final buzzer, four of those from King, who could not buy a bucket after collecting a game-high 16 points (he did draw a shooting foul with a second remaining, but the game was essentially over by then). 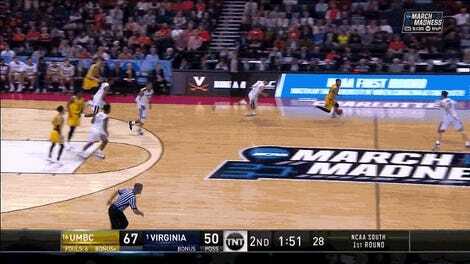 The extent of Virginia’s dominance, though, was almost unexpected, given their underwhelming start in the tournament. First, they held it together in the first round against 16-seed Gardner-Webb, just a year after getting clobbered by 16-seed University of Maryland, Baltimore County. This time, the Cavaliers avoided a double-digit upset later in the tournament, after Jim Boeheim and Syracuse toppled them in 2016 from the 10-seed, coming back from 15 down to win. Next up for the Hoos is a Purdue team that almost collapsed against Tennessee, blowing an 18-point lead before hanging on to win a shootout, 99-94. If Virginia’s defense shows up like it did in the climax of their Sweet 16 game, Purdue will suffer the same fate as Oregon: despair in the face of a defensive juggernaut built to crush souls and, more importantly, grind out tournament wins.